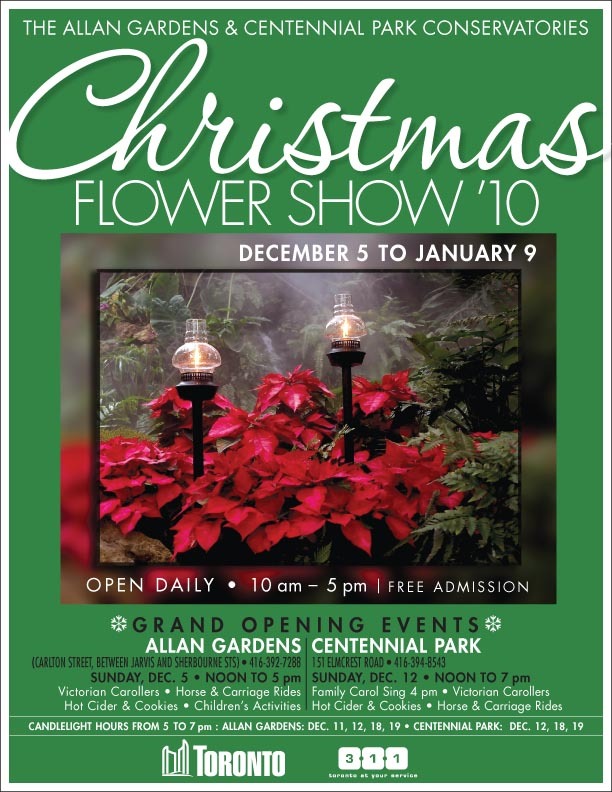 Our daughter Linda, who is a gardener for the City of Toronto, has been growing flowers for the city’s Christmas Flower Shows. The shows are December 5 to January 9, daily from 10am-5pm, and they are also free. The grand opening is at Allan Gardens (Carlton Street between Jarvis and Sherbourne) on Sunday, December 5, from noon to 5pm. (Tel. 416-392-7288) The Grand opening at Centennial Park (151 Elmcrest Road) is Sunday, December 12, noon to 7pm. (Tel. 416-394-8543). Both grand openings will have carollers, hot cider, cookies, and horse-and-carriage rides on those days. Poinsettias are the main flower in Toronto’s Christmas tradition and you’ll see lots of them. Romantic candles will light the displays from 5 to 7pm on December 12, 18 and 19. Greenhouses are wonderful places to meet people. You can ask questions about plants and Christmas traditions. If there’s a bridal party there, you can talk about wedding customs in different countries and now Canada.